I wanted to see what the furthest practical day trip from our beach house would be, so we headed this day for the Hoh Rain Forest. 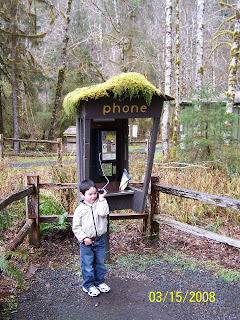 I had a four-year-old boy with me, so we had to make lots of stops to keep his interest up. We headed north on First Street, north on highway 109, and then northeast on the Moclips Highway. The Moclips Highway is almost deserted, but after 15 miles you reach the Quinault Fish Hatchery. My little boy had never seen a fish hatchery, so I decided to stop. It was a big hit. He was interested in the little hatchlings, the water tanks, big pipes - everything about the place. It made a good bathroom stop too. The hatchery is open to visitors only until 3:00pm. Shortly after the hatchery, you join highway 101, which you want to follow north in the direction of Forks. We stopped near the Quinault Lodge for gasoline - the most expensive I've ever paid for - and snacks. Both of these would have been cheaper if I had waited to reach Queets. After Queets the highway follows the coastline and gives you beautiful peaks of the ocean. I had already been to Ruby Beach, the most spectacular beach along this route, so this time I wanted to see a different beach. The other beaches are named South Beach, Beach 1, Beach 2, Beach 3, and Beach 4. Somewhere I had read about "Second Beach", so I decided to stop at Beach 2; although, I now think that Second Beach is another area further north. Anyway, if you had never been to any other beach, Beach 2 would delight you. A short walk through a pretty forest brings you to the driftwood pile. After clambering over the logs you come out on the wonderful, wide sandy beach. This sand runs almost unbroken down to Ocean Shores 60 miles to the south and perhaps as far to the north. My son enjoyed playing in a little stream that issued out from the base of the driftwood pile onto the beach. After that, we climbed on the largest driftwood log I've ever seen: it was probably a Spruce that I learned later in the Hoh Rain Forest grow up to 300 feet tall in this area. A bald eagle flew overhead. I was too slow with the camera to capture it. After prying my little boy away from this beach, where he might have played all day, if left to himself, we continued on to the Hoh Rain Forest. It's an 18 mile drive from the highway to the visitor center. Up to this point you have been able to drive at highway speeds, but on this road you slow down to 30 to 40 mph. It's a very pretty drive between a range of hills on the north and the Hoh River to your south. Admission to the park costs $15 per passenger vehicle. We walked the 3/4 mile Hall of Mosses trail. First, you cross a very pretty brook with crystal clear water. The ranger said we might see some silver fish there, but we didn't spot any. Up in the forest the main attractions are weirdly moss-covered trees - a grove of maples were particularly heavily draped - and enormous Spruce trees that grow up between 200 and 300 feet from the constant rain. The trail follows one fallen Spruce log for 190 feet, which the plaque says was not all of its original height. My little boy enjoyed the short hike a lot. On the way home we stopped briefly at Ruby Beach for the view, and then we reached home in time for the sunset. The distance from our house to the Hoh Rain Forest visitor center was almost exactly 100 miles. Driving time without stops in each direction was about 2 1/4 hours. This is the furthest northerly day trip you would want to make from our house. Another 20 miles north you reach the town of Forks, but there's nothing to see in Forks. Another 45 minutes beyond Forks brings you to some further beaches and sights. You might plan to circle up that way after departing our house and finding a place to stay between Port Angeles and Port Townsend. Saturday, March 1, 2008: This was a magical day at the beach. I drove onto the beach at Roosevelt Beach Road - 4 miles south of Pacific Beach. Another two miles driving south on the beach brings you to a stream issuing out of the Iron Springs Resort. I chickened out and crossed the stream on foot, but just after I saw another car cross easily. Copalis Rock lies a further one mile south of Iron Springs. It is an entirely isolated seastack rock. The next one of its size is found 20 miles north on the Quinault Nation reservation at Point Grenville. To the south, I don't know where the next such rock might be - maybe not until Oregon. The weather had turned out unexpectedly pleasant - mostly sunny with just enough clouds to make the sky interesting. 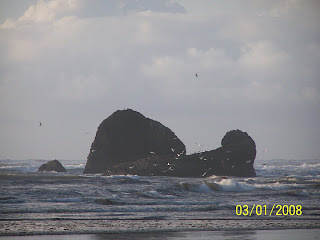 This picture shows dozens of seagulls flying around the rock. There seems to be a colony nesting there. I continued south to see some further small rocks scattered about the beach, and then I noticed a windsock in the distance. I had read about the Copalis beach airport, so I continued on to check it out. The airport consists of a windsock, two signs explaining that this is indeed an airport ("elevation 1 foot"), and a container labeled "Guest Book". The guest book was missing. There were no airplanes to be seen this day. However, online I read that up to 75 planes may visit on a sunny, summer day. I continued a bit further south to the Copalis River. This marks the boundary of Griffiths-Priday State Park, which I had visited the previous August and enjoyed wading in the river. This walk answered the question I had in my mind of whether there was another access point back to the road in this area. There is not, the river cuts off the last possibility. So it was a two mile slog back to the car into the wind, which had now picked up and turned chilly. Did I mention that I was barefoot? I didn't want to ruin my shoes in crossing the stream. My feet felt like icy bricks at times, but it wasn't so bad as long as I kept moving. The sun was setting at this time and I snapped several more pictures of the rock, sky, ocean, and setting sun.